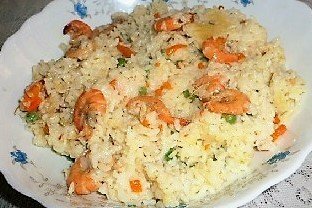 Prawn pulao recipe is another variety of rice based food item with added taste and flavor through the use of medium sized prawn with fried rice. It symbolizes aristocracy and also a specialty of the dinner or lunch that you offer to your guests. The prawn pulao is usually not for a big gathering, rather for the very special guests that you would like to entertain at home. 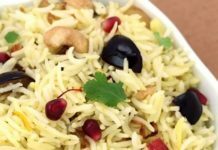 Although pulao is served during a party or on special occasions, yet you can make it at home to break the monotony of normal rice. The presence of medium size prawn not only enhances the color of the rice but also make your rice attractive to your children and other family members. If you want to make a different recipe which is simple but healthy for your family in a holiday this recipe is a perfect choice. I hope that your family members will appreciate this tasty and delicious food. Especially anyone who likes prawn will be happy to see the new prawn recipe. So friends, if you want to make happy to your family, you can try this prawn pulao recipe. Cooking of prawn pulao is not a very difficult thing, though, you need little careful about the ingredients’ quantity and sequence of actions. However, if you have cooked other types of pulao, it’s not a big deal for you. But make sure about the size of the prawn, which should medium, i.e. not so big and not so small. This dish is a tasty as well as a healthy and delicious food. Wash the rice and drain out water. Remove the skin of the prawns and clean with fresh water. Heat oil in a pan. Lightly fry prawns until their color is light brown and then keep aside. Slice the carrot to small julienne. Heat ghee (clarified butter) in a nonstick deep cooking pan. Add ginger paste and then add rice. Add carrots and peas to the fried rice and then mix well. Add 4 cups of hot water and cover with lid. Add salt to the rice. For the first ten minutes, cook over medium heat. Add prawn and sugar then cook over low heat. Cook until water evaporates. Add green chilies and cover with a lid. Turn off the burner and keep the prawn pulao on the burner. Tasty prawn pulao is ready to serve. Serve the pulao with the fresh salad or raita salad or any kind of pickles or chutney. This pulao is self-sufficient as an individual single dish. If you like my prawn pulao recipe please share my recipe with your family and friends.